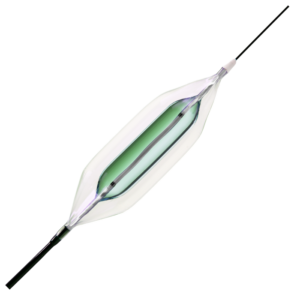 The AltoSa-XL GEMINI PTA Balloon is especially designed for double dilatation in large vessels. Zero-Shoulder Technology provides extra safety during the procedure. The high-pressure performance combined with low profile makes the AltoSa-XL GEMINI PTA Balloon an excellent choice to treat difficult large vessels and non-vascular lesions. Optimal stent retention for Open / Closed and Hybrid cell designed stents. Please note: The inner balloon is adapted to the required sizes of the outer Balloon. It has the same length as the outer balloon and offers a RBP of 6 atm.